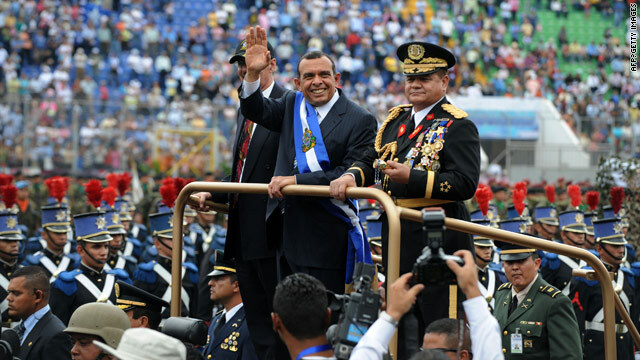 Honduran President Porfirio "Pepe" Lobo Sosa, center, reviews a military guard during Wednesday's inauguration in Tegucigalpa. (CNN) -- Porfirio "Pepe" Lobo Sosa was sworn in Wednesday as president of Honduras, bringing an end to the de facto government that ruled the country following a June coup. Lobo's term will end in 2014. The ceremony took place inside a packed national stadium. Lobo was elected in November in the middle of a political crisis that deepened after the coup against President Jose Manuel Zelaya. Roberto Micheletti became de facto president on June 28, hours after the coup. Micheletti was not present at Wednesday's swearing-in ceremony, citing health worries. Juan Orlando Hernandez, president of the National Congress, administered the oath of office to Lobo. Lobo's first order of business as president was to sign a decree granting political amnesty for those involved in the country's political crisis. He signed it in front of the crowd. The move makes it possible for Zelaya, who has been holed up inside the Brazilian Embassy in the Honduran capital, to leave the country safely for the Dominican Republic. Some in the crowd booed when Lobo thanked Dominican President Leonel Fernandez, who was in attendance, for striking a deal to receive Zelaya. Lobo also thanked Costa Rican President Oscar Arias, who drafted the foundation for an agreement between the two sides in the crisis. Lobo's government will move forward with the San Jose-Tegucigalpa Accord, an agreement that both sides signed but which has run into obstacles in its implementation. "Today, we begin a government with the participation of all the political parties," Lobo said. "There were no victors or losers [in the election], only one winner -- Honduras." Compliance with the accord could determine how other countries receive the new administration. Some countries have refused to recognize the outcome of Lobo's election because it took place under the rule of the de facto government. The de facto government of Micheletti and his supporters have insisted that Zelaya's removal was a constitutional transfer of power. But the United Nations, Organization of American States, European Union and most countries -- including the United States -- condemned the coup and demanded that Zelaya be reinstated.